CLion supports GCC and Clang compilers. This means that on Windows you can select between MinGW (or MinGW-W64) and Cygwin environments, Microsoft Visual C++ compiler (mind, the debugger is not available in this case) or Windows Subsystem for Linux toolchain. You can also use the Intel compiler, but some issues are possible since this case currently is not covered by our internal testing suite. Note: If you are using Visual Studio for C++ development (along with msbuild), try our ReSharper for C++. As for the debugger, CLion includes bundled GDB 8.1 for Linux and Windows (note, no GDB is bundled for Cygwin on Windows) and GDB 8.0 for macOS, bundled LLDB 5.0 on macOS and Linux. Custom GDB 7.8.x-8.1.x can be selected in CLion settings as well. 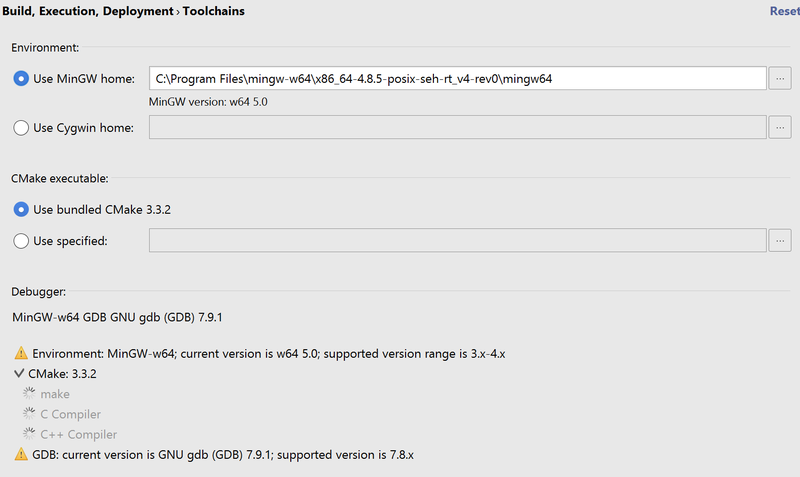 Where exactly can I get the latest version of mingw fully compatible with CLion? Actually this 'version' (4.8.5, 4.9.3) in fact represents version of GCC compiler while the version of MinGW-w64 distribution is different (5.0). That is the point which confuses many of our users since CLion currently supports MinGW-w64 distribution versions range is 3.x-4.x, so they see this warning in settings (since 5.0 doesn't fit). However, you still can use the version that is officially not supported (5.0), just be aware the some issues are possible. CLion uses Cygwin or MinGW on Windows. So you need to install one of this and then install clang from MinGW or Cygwin to use inside CLion (find here how to change compiler in CMake: https://intellij-support.jetbrains.com/hc/en-us/articles/207251865-How-can-I-change-compilers-in-CLion-). So, should I use WinGW instead of Cygwin? I don't know which one I should install on Windows. I mainly create c project and don't create c++ project. Any preference to which one I should use? Mark, it's up to you what to choose. This just means that for Cygwin you have to install GDB package as well. Thanks, Anastasia. I managed to install Cygwin though the setup process only has the option to install v7.10.1 of the GNU Debugger. I am not sure how to get v7.8 installed which is what CLion wants..
Mark: The easiest way to get a compatible compiler I've found is to install QtCreator and use the MinGW which is included in that. Since I want QtCreator anyway this worked for me. Mark, unfortunately, current CLion version doesn't support GDB 7.10 available in the latest Cygwin version. So currently you can install older Cygwin version to get GDB 7.8. Or use 7.10, though some problems exist in CLion, which we plan to get fix in the next version. Sorry for the inconvenience. Thanks for the suggestion, Peter. Thanks, Anastasia. I will just wait until CLion supports 7.10. I don't have an urgent need to use gdb, actually never used it before and was going to use CLion to learn it. GCC 6.1 isn't fully supported currently. Would be nice to get this sorted out. Thanks, Eric. You are right - it's not supported currently because of some problems listed as subtickets here: https://youtrack.jetbrains.com/issue/CPP-6883. Feel free to follow to get the updates. What is the proper way to implement an Intel Compiler tool chain on Windows? Should I be installing the Linux compiler versions into Cygwin and using that? I am trying to transition from a Windows-based Development environment to Linux, and I use Resharper++ for VS now. I would like to transition to CLion in my current windows environment to get used to it before I jump in completely into Linux. Sadly, to be compatible with my run environment, I need to link against some Intel libraries. How to start CLion on FreeBSD? What to do if debugger doesn't work as expected? I can’t find some functionality in CLion. What to do? Is there a community edition for CLion? Is CLion available as a plugin for IntelliJ IDEA? Keymaps and useful shortcuts, what to do if a shortcut is not working? Project can be compiled correctly, but highlighting, completion, refactorings, etc. in CLion are not working. CLion fails to find some of my classes. What to do? CLion fails to find some of my headers. Where does it search for them? How do I add my libraries to the project? How to change a build directory in CLion? Is it possible to use in-source-tree build? Why does CLion generate several build types at once?